Making the most of a powerful trade winds, Spindrift 2 continues her attempt on the Route of Discovery record at full tilt. On a starboard gybe throughout the day yesterday, the 40m trimaran skippered by Dona Bertarelli and Yann Guichard, put in two gybes to plunge into stronger easterly winds. The most delicate moment of the Route of Discovery record is coming up, with the transition zone to negotiate in approximately 30 hours, the link between the trade winds and a strong depression settling in between the Florida coast and the Bahamas. The situation is being closely monitored from ashore by Spindrift 2's router Richard Silvani and the trio of Guichard-Bertarelli-Israel on board the maxi multihull. From tonight they will have to apply their seamanship and race carry out another double gybe to best align themselves to cross the weaker wind zone that is the passageway to the strong northeasterly flow the other side that will take them on starboard tack to the finish at San Salvador in the Bahamas. “The problem is twofold,” explains Guichard. “If we cross the light area from the north, we will be out of that zone sooner, but for this, we will have to sail further north. If we cross it further the south, we will remain on the most direct route, but will have to negotiate the calm for longer." The good news for the crew is that Spindrift 2’s lead over the current record holder, Franck Cammas’ Groupama 3, is currently more than 330 miles. “Reason enough to take it calmly”, says Richard Silvani. “Things are unfolding as we had expected from the outset at Cadiz”, Guichard continues. “We will not take any risks. We will choose the latitude to attempt the passage in the next five or six hours. We should not lose more than four to five hours in the process." Dona Bertarelli is really getting her bearings on her first Atlantic crossing. Her account is most revealing of the complexity of piloting the largest racing trimaran in the world. ” I managed to overcome the psychological barrier when I was able to successfully helm at 40 knots of boat speed. The difficulty is not so much the wind strength or the boat speed, but the size and direction of the waves that complicate the task and are still today a challenge for me. Keeping the boat consistently at high speed and in tune to the sea state requires technique, concentration and also physical strength. When conditions are very tough, I do not helm for more than 30 minutes at a time”. She also gives some insight into life on board the world's largest racing trimaran mid-Atlantic: “It is very hot inside. Everyone is suffering from the clammy humidity, and rest has become more difficult, while preparing meals has become a hard slog in a real sauna! I really picked up the pace, however demanding, sailing all the time above 30 knots. Loud noise is constant below deck, the sound of waves crashing on the hulls, the sheets rattling with each shock, the grinding of the boat…. but also on deck, with the wind, and life on board is sporty, with the boat constantly swinging about, racing down a wave to then to crash, pitch up again, leap out of the water … it’s moving all the time! 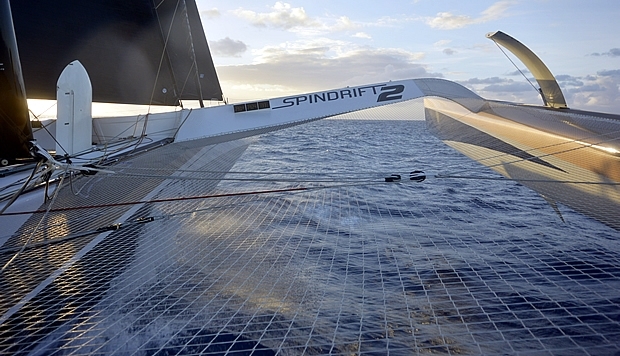 At 14:30hrs GMT this morning Spindrift has a 311.99 miles lead on the current record time.